720P @ 30 FPS & 960H @ 30 FPS Real Time Recording / Playback Quality. 1x HDD bay, support up to 4TB. 1x Audio-in / 1x Audio-out. Firmware upgradable. DVR Motion detection triggered events can be promptly notified by loud audible alert and / or Email notifications to PCs or smart phones. Dual streaming technology to encode recording stream and network stream separately. Support NAT function, QR code scanning by mobile devices. Live view and access control through Internet Explorer, Firefox, Chrome, and Mac OSX/Safari. Streaming live video / playback on mobile smart phones or tablets via free app. With the passion of perfection, Aposonic has released its newest online monitoring platform, which provides users the capability to consolidate multiple surveillance DVRs, from the same series, over the CMS software. Users can monitor multiple DVRs and locations at the same time. 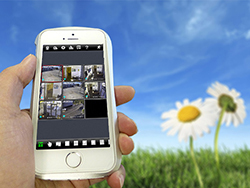 Up to 100 channels of live streaming cameras can be viewed simultaneously. Aposonic A-S0401R21SL-AHD DVR supports streaming video on PC, Mac OSX, iPhone, iPad, Android phone and tablet. Users are able to monitor their most valuable assets anywhere around the world with their mobile devices over WiFi or 4G/3G network. Ever find netowrk configuration and port forwarding depressing and troublesome? Leave the geeks stuff to tech people and live our life easier. Dimension W 10.2" x D 8.4" x H 1.8"